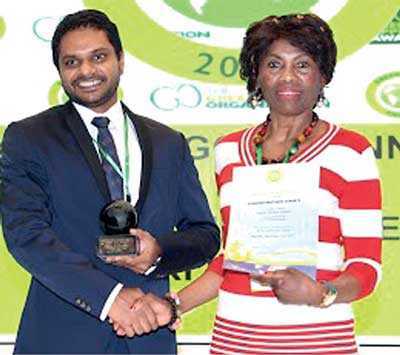 The Carbon Consulting Company (with MTI as a Strategic Equity Partner) and its long term client, one of the world’s most awarded sustainable tea companies – Eswaran Brothers Exports celebrated another outstanding joint achievement when Eswaran Brothers Exports was awarded Global Gold Winner, in the Food and Drink category of the Green World Awards. These awards have become one of the world’s most prestigious recognitions for companies, organisations, and governments championing for a greener future. This new accolade comes to the company as a result of the extensive work carried out by CCC in creating a strategic sustainability road map for the entire Eswaran group of companies, and establishing concrete milestones along the journey. Already certified as the World’s First CarbonNeutral Tea company, Eswaran Brothers has continued to push the boundaries in the areas of product and organisational Water foot printing, Supply Chain Water and Bio Diversity assessment and creating a carbon negative tea product – just to name a few. Eswaran Brothers is a third-generation family of tea tasters known for their mastery in crafting exclusive tea blends for their customers worldwide. Building on their heritage of care, the company has added arrange of health and wellness teas, recently launching a line of superfood teas to include organic ingredients like Turmeric and Moringa in order to fulfil its objective of developing products that help customers and employees live well naturally.